The International Olympic Committee has invited a Vatican delegation to take part in the opening ceremony of the Winter Games, and to attend its general meeting as an official observer. The delegation to be led by Msgr. Melchor Sanchez de Toca Alameda; who is undersecretary of the Pontifical Council for Culture and the head of its "Culture and Sport" section. This will occur at the Olympic Stadium in Pyeongchang, South Korea, Feb. 9. The Olympic committee's annual session will occur on Feb. 5-7 where voting members meet to discuss major issues in the world of sports. Msgr. 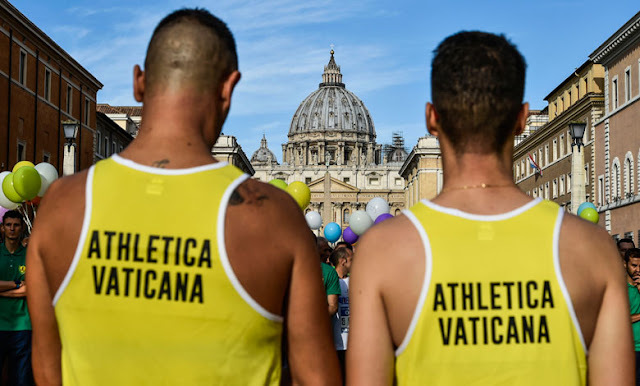 Sanchez, a former modern pentathlete, told the Vatican newspaper he would present Thomas Bach, president of the IOC, and all Korean Olympic athletes with the official yellow and white jerseys worn by members of the Vatican's running club "Athletica Vaticana," which -- like its other sports teams -- is made up of employees of Vatican City State and the Holy See. Athletes from both North Korea and South Korea were to walk together during the opening ceremony and were to carry the Korean "Unification Flag" -- a flag designed to represent all of Korea when athletes from the North and South participate as one team in sporting events. Nearly two dozen North Korean athletes received permission from the IOC to compete in the Winter Games, which take place Feb. 9-25. While athletes will compete for their respective countries, there will be a unified Korean team at the Olympics for the first time as players from both North and South Korea make up a team in women's ice hockey.